Video could be stopped along the way to have discussion about the graphs embedded in the video. Use NASA NEO website to get current data. Educator might want to bring the topic of self-reinforcing feedback mechanisms into the discussion. This video and its accompanying text ([link http://svs.gsfc.nasa.gov/vis/a000000/a003600/a003619/]) demonstrates how, using satellite observations, scientists can monitor changes in the global and regional climate by observing how regions of the Earth's cryosphere shrink and expand. The cryosphere has experienced further changes since 2009. This video remains useful, but educators should seek current data to add to their discussions. For example, here is a [link http://climate.nasa.gov/news/2510/see-how-arctic-sea-ice-is-losing-its-b... '2016 NASA animation about Arctic ice']. 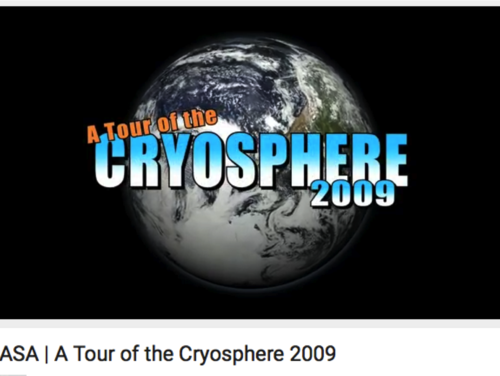 Comments from expert scientist: The source of the video are NASA satellites so this is a direct view of what has happened to cryosphere over the years, until 2009. It is a kind of direct assessment of the cryospheric changes taking place. The video however, will prove very helpful in educating the people about the changing croysphere and its impact on global climate. Draft of script is provided for students to follow along. Though some of data references are dated, overall trends in different geographic areas continue in the same direction.